Arsenal boss Arsene Wenger claims keeper Jens Lehmann won a "poker game" with Villarreal's Juan Roman Riquelme to reach the Champions League final. 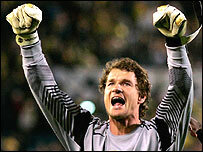 Lehmann's late penalty save set up Arsenal's 1-0 aggregate victory. And Wenger said: "I said to myself that if it is our year, Jens will save it. I knew he had strength of character, and I knew he would not be beaten easily. "It comes down to psychological reason and Jens guessed right. It was more of a poker game than good training." Lehmann struggled to come to terms with the Premiership after his move to Arsenal, but has been outstanding this season. Wenger said: "Maybe I made a good decision to drop him last year. "I am pleased because when a guy shows professionalism and a winning attitude, you always want him to be rewarded. "When I think where he started when he came to England, and the steps he has made since, he deserved a lot of credit." And Wenger said: "We were lucky, but I'm very proud of the character in that young team and I'm very happy." Wenger admitted: "We just didn't play, whether that was down to physical or psychological reasons I don't know, but we showed such character. "We never came into our fluent game, so we needed a bit of luck and resilience and showed that. "Now we are in the final we want to win. We have had a great European season and now we want to finish it off." Lehmann said: "We deserved it because we fought very hard. We didn't think it was a penalty, but I thought about Riquelme putting one to his right last week and decided to go there. "It's a great night, but right now I want to win that final. "It was a gift of a penalty, but fortunately he chose the same side as me. If you want to reach the final you have to make saves like these." Recalled Sol Campbell, back in the side after a season almost wrecked by injury, added: "Jens is in fantastic form now and I had every confidence in him. "It's been a tough road but I've kept going. The lads have been fantastic for me. I got my chance here and I've done a job. "It's brilliant for us. It's also great for the manager Arsene Wenger to get to the final in France - I'm sure he will get a great reception." Arsenal captain Thierry Henry also paid tribute to Lehmann, saying: "Jens had an amazing game and not only the penalty. Throughout he was magnificent. Once you are in the final anything can happen. "We have shown we can play with flair and with desire. This result was about desire and commitment - we worked hard and everyone was chasing."